Or is it just the people who put together the ingredients? This is probably not the worst food perversion we have witnessed after the frenzy of Fry Everything stories last year. But because it starts with something as wholesome as bacon (as opposed to, say, a Snickers bar), the transgression is all the more gut wrenching. 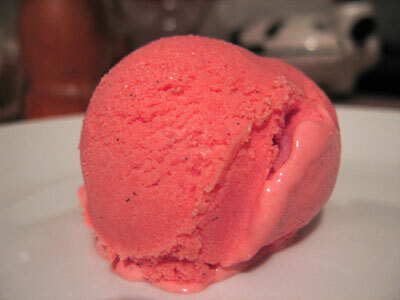 The good news for eaters is that if this concoction makes you ill, you can alleviate your pains without leaving the “frozen dessert” food group… Yes I’m talking of that other great creation, Pepto Bismol Ice-Cream (which in fairness must be commended for using real vanilla). Yes people, it’s not just the economy that signals the end-times. Deep-fried lattes and candied bacon ice-cream surely preceed the four horsemen of the apocalypse. This entry was posted in funny, random and tagged bizarre, carbs, food by missbossy. Bookmark the permalink. You know, I think I could’ve used that Pepto ice cream when I had the stomach flu in January.